The Tewkesbury bus service runs on a Wednesday to coincide with Market Day. It arrives in Tewkesbury at 11.00 am and leaves for the return journey at 1.00 pm. Malvern Link; Great Malvern; Welland; Castlemorton; Birts Street; Rye Street; Pendock; Longdon Heath; Longdon; Sledge Green; Forthampton; Corse Lawn and Bushley. 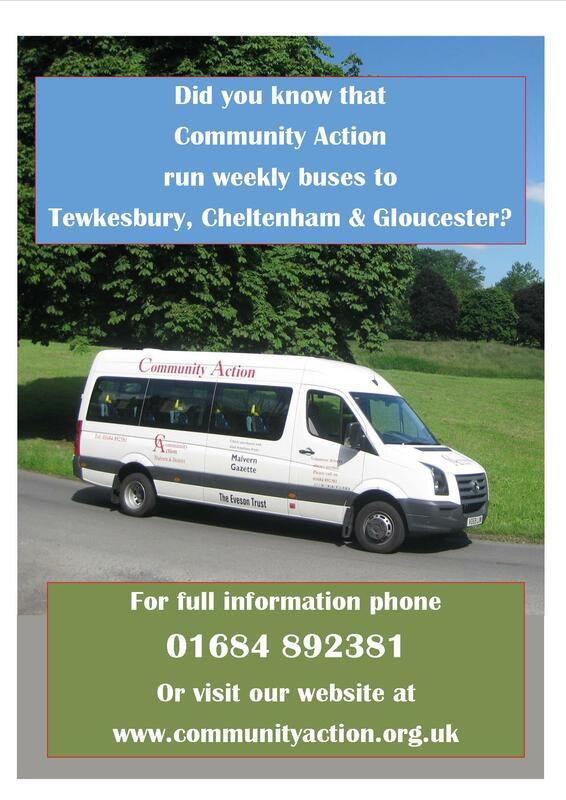 Every Thursday we offer a minibus service to Cheltenham and Gloucester. It arrives in Gloucester at approximately 10.45am and heads on to Cheltenham for 11am, returning from Cheltenham at 1.50pm and Gloucester at 2.15pm. 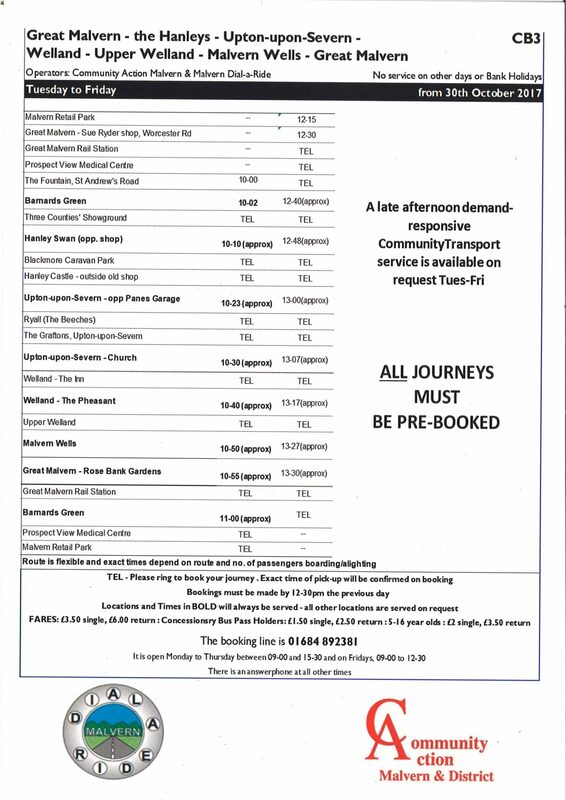 Please see CB2 Timetable and Poster below. 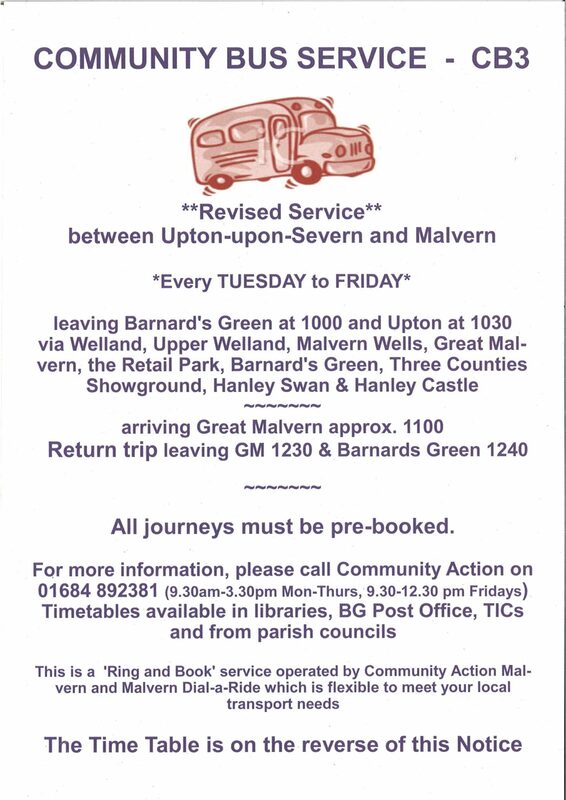 Malvern Link; Great Malvern; Barnards Green; Three Counties Showground; Hanley Swan; Welland; Castlemorton; Rye Cross; Sledge Green; Pendock; Eldersfield; Corse Lawn; Staunton and Maisemore. There is a return journey starting at 12.15 and an additional later afternoon service by prior arrangement. This is a ring and book service, for more information please phone Community Action on: 01684 892381. Friday Morning from 10.45am – Pick up at Halfkey Road, Beverley Way, Westward Road, Tanhouse Lane to Malvern Retail Park dropping off at Morrisons and return at 12.25pm. 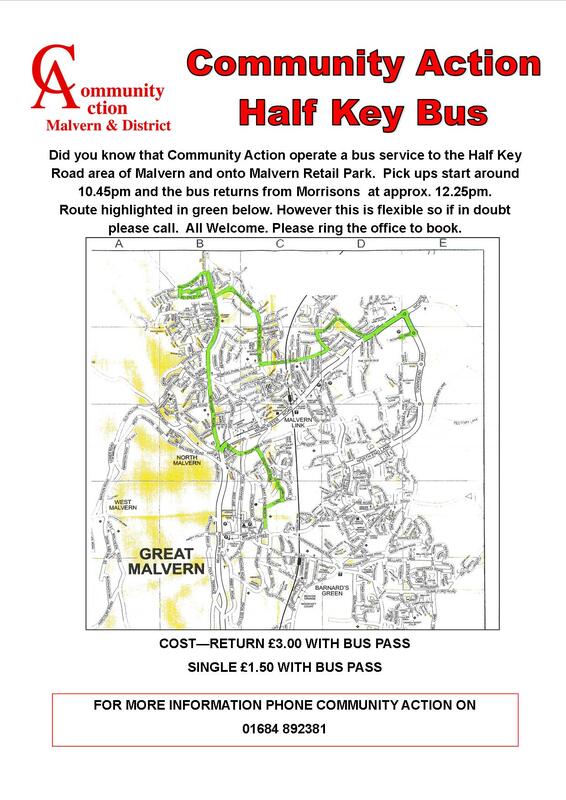 Please see Half Key Bus Route below. Other stops available by request. For further information regarding the Minibus Service click here.